Apple has a hit on its hands, or maybe we should say in its ears. AirPods have become the second best-selling Apple product out of the gate of all time. More interestingly, there are signs of AirPods now becoming a cultural phenomenon. AirPods do a superb job of demonstrating Apple’s competitive advantages with wearables, a product category that will come to define Apple for decades. A few weeks ago, a video from “Inside Edition,” a U.S. TV newsmagazine, jumped out at me. The video, shown below, had the attention-grabbing headline “Can Your iPhone Be Turned Into a Spyphone?” The video’s focus was on the iPhone’s “Live Listen” feature, which turns an iPhone into a microphone. While the feature, designed to work with hearing aids, has been around for some time, Inside Edition’s video was focused on how AirPods can now be used to “spy” on someone. After watching the video, most viewers likely came away thinking AirPods have a built-in spy feature that Apple had secretly launched. The “Sorry, I can’t hear you over my AirPods” meme pokes fun at AirPods wearers for being oblivious to their surroundings. In some cases, a pair of AirPods are photoshopped on fictional characters right before something bad happens to them in a movie, as if wearing AirPods made them unaware of what was about to happen. There have been various spin-offs of the meme, with interpretations that are more subjective. Other memes have poked fun at people using AirPods as a social signal to flaunt wealth and status. These various AirPods memes took off at the end of December, just as millions of people received AirPods as presents. Reilly told BuzzFeed: “I absolutely refuse to lose [my AirPods]. My cat ate through two pairs of Beats Bluetooth earphones, and all my other earphones. So I got the AirPods because there was no wire for her to chew but I still needed something to connect them.” She refined the design and is now selling “Airings” for $20. In what has become a daily occurrence, various pop culture references that poke fun at AirPods, such as the following tweet, are going viral. While it is easy to look at AirPods memes, videos, and tweets as harmless fun or jokes, such a view misses what’s really taking place. AirPods have become part of culture. A product which the tech press declared too awkward-looking to ever go mainstream has now made headphones with wires look out of style. The various AirPods memes, videos, and tweets are byproducts of AirPods becoming incredibly popular in a very short amount of time. In essence, AirPods have gone viral. One way of measuring the viral nature of AirPods is to look at Google Trends, which is powered by Google search data. As a general rule, Google Trends is a useful tool for gauging consumer interest in a product, especially for a relatively new product like AirPods. Compared to some of the other methodologies out there for gauging interest, like consumer surveys, analyzing the degree to which people use Google to search for something is a more reliable source. The one caveat that is important to keep in mind with Google Trends is that if searches aren't taking place through Google, but instead on Amazon for example, that interest won't be reflected in Google Trends. For AirPods, this factor isn’t much of a concern. As shown below, search interest for “AirPods” in the U.S. began to shoot higher this past November, nearly two years after launch. Search interest then peaked between Christmas and New Year’s. The data is indexed to 100, which denotes the maximum amount of search interest for “AirPods” during the selected time range. Indexing allows us to see how search interest levels have changed over time. Search volume for AirPods during the most recent holiday season was five times the search volume registered during the 2017 holiday season. Even more impressive, AirPods search interest this past December was ten times the volume registered during the December 2016 launch. Two weeks ago, AirPods search interest (the blue line in the image below) exceeded Apple Watch search interest (the red line) for the first time. No other Apple product has come close to this sudden surge in interest years after launch. For example, Google Trends for “iPad” in the U.S. from 2009 to 2019 is shown below. While the iPad saw a remarkable amount of interest at launch in 2010, interest levels ended up plateauing just two years later. The amount of iPad interest seen at launch was 30% the volume of peak search interest. This likely explains why iPad was like a rocket out of the gate when it came to sales, only for sales to plateau and eventually fall. The surge in AirPods search interest isn’t just a reflection of people looking for AirPods memes and videos. The higher interest is reflective of stronger sales. According to my estimate, Apple is on track to sell approximately 40 million pairs of AirPods in 2019, representing close to 90% year-over-year growth. There are already at least 25 million people wearing AirPods. This total will likely exceed 50 million people later this year. These are massive sales and adoption figures for a two-year old product that has never received an update and rarely goes on sale for less than its $159 selling price. As shown in Exhibit 1, AirPods are currently the second best-selling Apple product out of the gate in terms of unit sales, behind only iPad. An argument can be made that the iPad was an outlier and that no other Apple product will come to close to exceeding iPad unit sales. One issue found with Exhibit 1 is that quarterly unit sales are impacted by seasonality. In order to remove this seasonality, Exhibit 2 shows unit sales on a cumulative basis. While iPad’s clear sales lead is hard to miss, AirPods are the second-best selling product two years after launch, slightly ahead of iPhone at the same point after launch. On a cumulative sales basis, AirPods are outpacing Apple Watch by 40% at the same point after launch. Despite Apple Watch selling well, there hasn’t been a similar kind of viral aspect to the product. There aren’t various Watch memes floating around Twitter. What is it about AirPods that turned the product into a pop culture viral sensation? There are likely a few factors. High Visibility. AirPods are literally hanging out of people’s ears. They are nearly impossible to miss when worn. Since the lack of wires make AirPods useful for outdoors activities including walking and running, they are bound to be seen in people’s ears while out and about. AirPods sightings have seemingly grown exponentially in recent months. Meanwhile, an Apple Watch is easily covered by long sleeves or jackets. In cold weather climates, Apple Watch visibility is reduced to indoor settings for months at a time. New and Different. AirPods, although a successor to wired headphones, look very different without the wire. The product also stands out from other wireless headphones. In some ways, Apple designers didn’t try to hide the fact that AirPods lack wires. The product is intriguing, sparking curiosity. Social Signaling. Wearing white EarPods signaled to others that an iPod, or eventually an iPhone, was found in the wearer’s pocket. Similarly, wearing AirPods signal to others that the wearer likely has an iPhone and is able to pay $159 for a pair of wireless headphones despite a wired pair being included in the iPhone box. AirPods end up playing a more strategic role for Apple than just being a fun smartphone accessory. 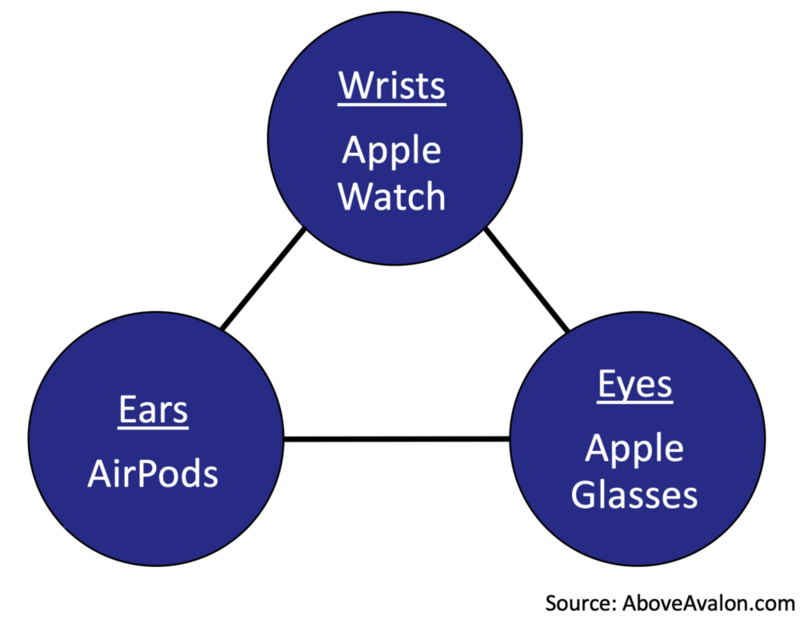 AirPods represent one half of Apple’s wearables strategy. Ecosystem. A selection of tools targeting different parts of the body. Design / Fashion Expertise. Developing wearable devices that people want to wear and be seen wearing. AirPods demonstrate Apple’s significant lead when it comes to developing a wearables ecosystem and possessing a design / fashion acumen that other companies lack. It won’t be enough for a company to just sell a smartwatch or a pair of wireless headphones. Instead, the key to mastering wearables will be to offer an ecosystem of devices that work seamlessly together. This dynamic will require companies to have an expertise in combining hardware, software, and services, something Apple has been focused on for decades. The winners in wearables will be companies successfully waging simultaneous battles for real estate on our wrists, ears, eyes, and body (i.e. smart clothing). As shown below, there are three key pieces of real estate that are currently up for grabs or will soon be available for grabs: wrists, ears, and eyes. In 2015, Apple entered the wearables arena with Apple Watch. The product kicked off Apple’s attempt to grab wrist real estate. The wrist has proven incredibly useful given its line of sight for viewing information at a quick glance in addition to its ability to foster certain health monitoring capabilities. While Apple Watch is going up against traditional mechanical watches, competition ends up being much broader. Ultimately, Apple Watch is competing for a place on wrists. One of the Watch’s fiercest competitors is non-consumption, or empty wrists. A similar dynamic is now unfolding with AirPods. The device is Apple’s attempt at grabbing ear real estate. Competitors for this real estate include both wired headphones, like EarPods, and non-consumption in the form of empty ears. Even though AirPods may be light on features today, having tens of millions of wearers today increases the probability of subsequent AirPods versions seeing strong adoption. The battle for our eyes is on the horizon, not quite ready for prime time. A pair of smart glasses have the highest likelihood of being Apple’s next major product category. The key to grabbing real estate on our wrists, in our ears, and in front of your eyes is selling tools that people want to wear and be seen wearing. A product’s design, defined as how we use that product, is crucial in this regard. With Apple Watch, interchangeable bands have played a crucial role in driving Watch adoption. AirPods’ elegant charging case has come to define the product’s experience. Instead of positioning technology as a barometer for wearables success, the intersection between technology and fashion will determine which products people will want to wear throughout the day. Lessons learned from Apple Watch, and now AirPods, will give Apple an advantage when it comes to developing a pair of lightweight and unobtrusive smart glasses. Unlike Amazon and Google, which are desperately trying to position voice as a way to leapfrog over the current smartphone/tablet paradigm, Apple is approaching things differently. Instead of betting on a voice interface that pushes some information to a stationary screen, Apple is betting on mobile screens that are home to a digital assistant. Apple is placing a bet that consumers will want the familiarity found with touch screens to transition to a future of greater AI and digital assistants. Apple Watch ends up serving as a bridge to the future. The most valuable mobile screens in our lives will increasingly be worn on the body. In addition, Apple thinks screen manipulation via fingers, hands, and eyes will remain a crucial part of the computing experience for the foreseeable future. AirPods play a role in this vision by harnessing sound on the go. Wired headphones are an endangered species as there is no place for wires in a wearables world. While the viral nature of AirPods may subside over the coming months, especially as adoption continues to expand, the biggest takeaway from the various AirPods memes, tweets, and videos, is that wearables continue to infiltrate society. We are witnessing the early stages of the wearables era.